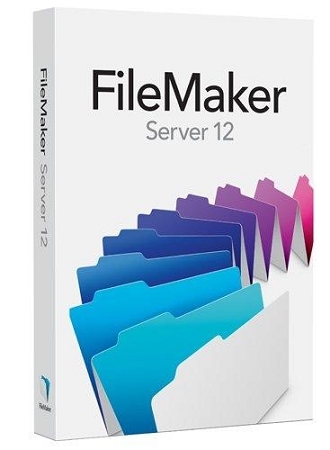 FileMaker Server 12 gives you reliable, high-performance access to your data.Securely host groups of FileMaker Pro users over a network or on the web by adding FileMaker Server (separate purchase of FileMaker Pro required). It's fast, reliable, easy-to-use server software for securely managing your FileMaker Pro databases. What's new in FileMaker Server 12? Get greater performance over a wide area network (WAN) with FileMaker Server 12. Finding data can be up to 40% faster as FileMaker Server sends less data across the network with fewer round trips. In addition, when searching in a field formatted as a value list or when filtering information in a most portals, data will normally be retrieved in less than a second. Now a 64-bit application, FileMaker Server 12 can have more memory available to run even faster, especially with large databases or a large number of client connections. By temporarily storing more data in memory and only writing changes to the disk, FileMaker Server 12 processes data faster and more efficiently and reduces the possibility of file corruption. Enjoy greater stability in FileMaker Server 12 with a re-architected database server. In addition to ODBC running as a separate process, now scripts and plug-ins run together as a separate process, and Progressive Backups run independently as well. So if one of these processes happens to fail, it won’t affect the database server. The server will continue to serve data, just as expected. Taking advantage of the newly re-architected container fields in FileMaker Pro 12, FileMaker Server 12 has even more processing power allowing you to progressively download videos and other media to your FileMaker Pro and FileMaker Go clients. Now you can flip through records without waiting for files to completely download before moving to the next record. Backing up large data sets using FileMaker Server 12 is faster and more efficient than ever. Once you have a baseline backup, only files that have changed in your solution are backed up again. When storing data externally using the enhanced container fields in FileMaker Pro 12, only the container data that has changed is backed up. The web publishing engine in FileMaker Server 12 has been completely re-written and is now faster than ever. With the ability to handle multiple data requests at the same time, along with more efficient memory processing, you will see performance improvements of up to 65% when your custom websites interact with the PHP or XML API. Install FileMaker Server quickly. Manage your databases remotely and automate administrative tasks. Get anytime access to your data with 24/7 availability. Protect your data with scheduled live back-ups, which run even while your databases are in use. Connect up to 250 FileMaker Pro users by adding FileMaker Server. Plus get greater security and network performance. Create custom, data-driven websites using PHP or XML. Get up to 100 concurrent web connections.